Iranian news agency claims Russian air force hits jihadist targets close to the Golan Heights, in what would be closest strikes to Israel. Russian jets have struck Syrian rebel positions near the Golan Heights, marking the closest Russian airstrikes to the Israeli border since Russia's intervention in Syria began, according to Iranian reports. Semi-official Iranian Fars News claimed the Russian air force hit Islamist rebels in Tal al-Harra and Tal Antar near Deir al-Adas in the northern countryside of Daraa, which lies close to the Syrian-controlled Golan. The report specifically claimed that targets belonging to Al Qaeda's Nusra Front and rival jihadists ISIS were struck, though those details could not be confirmed. Pro-Assad sources usually claim airstrikes target those two jihadist groups - which do hold some territory in southern Syria - even though they often target other rebel groups. 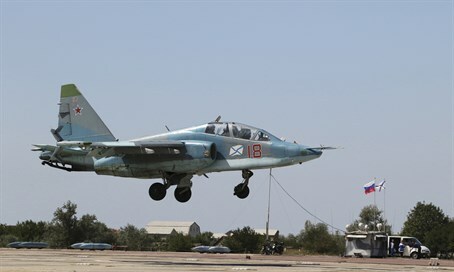 Fars, which like all Iranian media outlets is close to the regime in Tehran, claimed "(t)he Russian fighter jets' attacks have an important message for Israel while Tal Aviv (sic) is trying to pretend that it has reached an agreement with Moscow on Syria's Southern skies," referring to an agreement reached between Israel and Russia to coordinate operations over Syria. That agreement was reached earlier this month after a meeting at the Kremlin between Russian President Vladimir Putin, Israeli Prime Minister Binyamin Netanyahu and several top Israeli military officials. Israel has avoided being sucked in to the Syrian civil war, which has already claimed over 250,000 lives, but is believed to have carried out several airstrikes against sophisticated weaponry destined for the Iranian-backed Hezbollah terrorist group in reward for its massive deployment in Syria alongside pro-regime forces. There were concerns complications could arise given Russia's intensive air campaign against rebels which began last month, as well as the presence of Russian troops on the ground, but those concerns were allayed after the meeting in Moscow, at which a special "mechanism" was announced whereby both sides would alert the other prior to carrying out operations. Indeed, officials revealed that Russia notified Israel in advance of beginning its air campaign in the war-torn country.